Denisa Prochazka was born in the Czech Republic and moved to Canada in the mid eighties. Denisa graduated from OCAD University in Toronto. She continued her studies in Florence, Italy, where she advanced specializing in figurative sculpture. Denisa lives and works in Ottawa as an Independent Fine Artist and is an Executive Member of the National Capital Network of Sculptors in Ottawa. Denisa specializes in the creation of large relief sculptures combining classical and contemporary techniques. Large and imposing while light and ethereal, Denisa's art is intended to be spiritually healing and powerful in its symbolic intension. Using clay as the canvas on which she communicates, the artist offers us imagery that is vibrant with mystical and historical elements. She puts forward an iconography that is timeless and strongly feminine, while rich in technique and intention. Through her work, she offers a very personal look into the necessity to contrast past with present, personal with universal, reality with dream state. 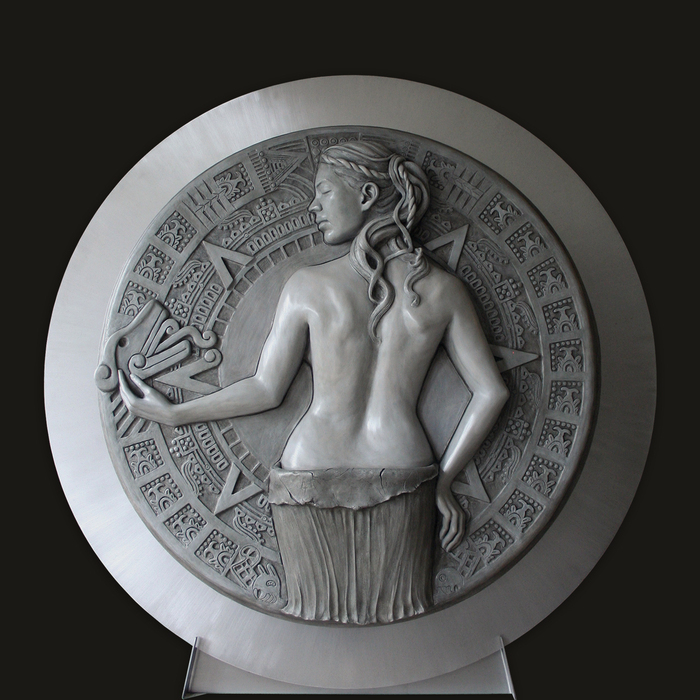 Denisa Prochazka large relief sculptures are life size and are originally sculpted in clay, then cast in media such as hydrostone, aqua resin or metal. In my sculpture, I have created the Maya/Aztec calendar as an ancient symbol of time with a woman embracing a serpent, the universal symbol of wisdom. According to the native perspective, it is through the female energy and wisdom that humanity will transition into a higher state of consciousness within our time. This artwork is 5 x 5 feet tall and was originally sculpted in clay, then cast in Hydro-stone and Aqua resin, mounted on a steel base. 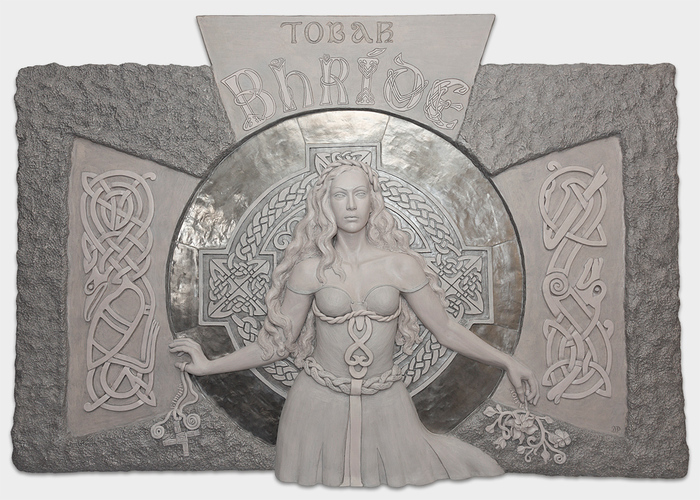 The Celtic Goddess Bride was created as a commission work for Saint Brigid Centre for the Arts, an Irish Arts Centre in Ottawa, Canada. It is a large sculpture wall piece measuring 5 x 8 feet. 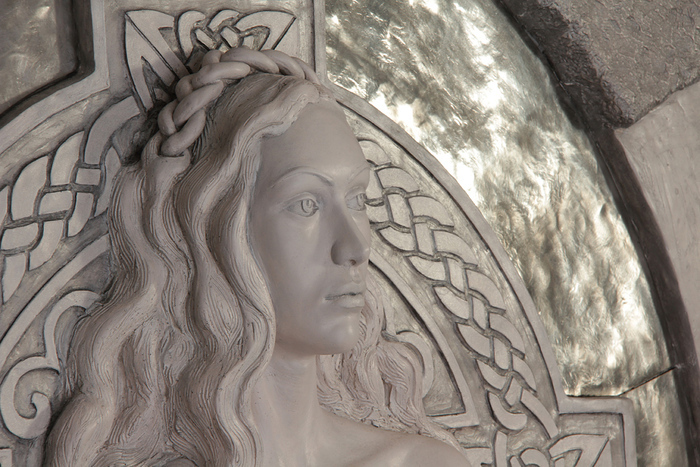 Portrait detail of the Celtic Goddess sculpture. Life-size.